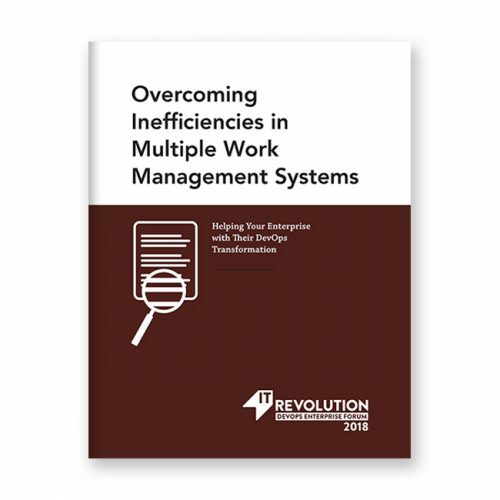 Multiple work management systems that originate in functionally oriented silos or independent teams create long-term inefficiencies at the enterprise scale. As enterprises adopt Agile and DevOps, a mismatch between SDLC and ITIL practices, as well as tool silos, impedes both flow efficiency and work understanding within individual team and across teams. This paper focuses on helping enterprise practitioners and management leaders who have multiple work management systems that their teams deal with every day and who struggle to provide visibility to the work as well as an improvement model to make the work and systems better. Large enterprises are traditionally organized by function and managed to optimize vertically for specific outcomes. In IT, this often means organizations specialize in functions such as design, development, QA, and operations. Many decisions are made in the context of those functional silos as opposed to the end-to-end flow of delivery across those teams. This mode of decision-making affects work management practices as well as tool selection for each group. In traditional operating models of siloed teams, this is certainly an issue when creating an environment of task-driven queues. As enterprises adopt Agile and DevOps, this mismatch between SDLC and ITIL practices, as well as tool silos, impedes both flow efficiency and work understanding within individual team and across teams. This paper is focused on enterprise practitioners and management leaders who have multiple work management systems that their teams deal with every day and who struggle to provide visibility to the work as well as an improvement model to make the work and systems better. As the DevOps community has been rapidly growing, delivering value faster and with better quality to meet customers demands, they forgot one thing: bringing security along for the ride. This "love letter" to security is one step to rectifying that oversight, with clear commitments and a Risk Control Matrix to collaborate on risk mitigation into the future. As DevOps continues to challenge the status quo and improve business outcomes for software systems, many of the world’s larger enterprises also need to identify how to scale these practices across large, complex systems composed of hardware, firmware, and software. 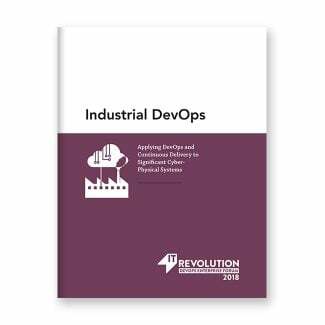 This paper provides an extended definition for DevOps as it applies to large, complex cyber-physical systems, and offer some recommendations on how to effectively leverage continuous delivery and DevOps these systems. DevOps adoption continues to rise as enterprises migrate to the cloud as part of their digital transformation initiatives. The combination of DevOps and cloud infrastructure is disrupting the traditional job expectations of enterprise infrastructure and operations (I&O) professionals. This paper offers guidance for I&O professionals so they can evolve their skill set and become an integral part of DevOps initiatives and competent in cloud infrastructure code. Enterprises have invested significantly in modern software delivery methodologies—Agile, Scrum, DevOps, SRE, and cloud—to mobilize and accelerate their technology transformations. Yet many organizations still struggle to see the intended acceleration and, more importantly, positive outcomes from this investment. The only way to fix this is to shift how we manage IT, by moving from project orientation to product orientation. This paper will show you why and get you on your from project to product. Sometimes we attribute the “secret sauce” of success to technology or product, but what if a truly strategic advantage originated from the team or organization’s leadership style? The characteristics and attributes of “transformational leadership” have been shown to do just that. This paper examines the qualities of transformational leadership and provides a personal assessment and quick start guide to help you on your way to becoming a transformational leader.